Most people see black high top chucks and think that they are unchanged from the first day that Chuck Taylor put his signature on a pair. While that assumption is mostly true, The ChucksConnection has completed an in depth study of different pairs of the same size over approximately the last fifty years and found that there have been a lot of subtle changes. While any one change may or may not seem significant, there has been an evolution in manufacturing processes over the years that has affected the look of the shoes. For our study, we took a careful look at seven pairs of shoes manufactured in the past four decades. The shoes were all black high tops of the same size, except for one pair of navy blue high tops. The study included five pairs made in the USA — two pair from the 1970s, one from the 1980s, and two pair from the 1990s — one pair made in Viet Nam, and one pair made in China where nearly all of the manufacturing is now being done. Each shoe was photographed in close up and from a set number of positions. Special attention was given to the ankle patch, heel patch, inner and outer stitching, insole, toe cap, and outsole on each shoe because these are the places where the most changes have occurred over the past fifty years. Our study starts after the time that the Converse company had made some substantial changes and innovations in the manufacture of the Chuck Taylor shoe, by introducing chucks in a “rainbow” of colors in addition to the traditional (and still most popular today) black and white models. The shoes had also moved from the realm of just being a basketball shoe for serious players to a most general wear athletic shoe. As a result, the players name label printed inside the tongue was eliminated. (The label said Converse Chuck Taylor Athletic Shoes, and below that there were two outlined rectangles, one labeled “Players Name”.) Another big change was in the heel patch, which used to be dark blue or black in color with white lettering, but was now starting to be made on a white heel patch with black lettering. The heel patch change occurred in the mid-1970s. More than fifty years ago, black Chuck Taylor high tops had less bright ankle patches and different heel patches. The white high tops you see in the photo above are typical example of how high top chucks looked in the 1960s. The most noticeable difference is the blue heel patch and the distance of the ventilation eyelets which are wider apart. Although the two double rows of white thread outer stitching around the metal eyelets has remained virtually the same throughout the decades, the outer stitching from the toe cap to the toe guard has changed along with how the canvas inner lining and tongue are attached to the rubber upper wrap with toe cap and the outer canvas. In the 1960s and through the 1980s, chucks were made with an extra piece of outer canvas that was used to give extra strength to the inner lining and help secure the tongue. You can see from the close up that this extra piece of canvas was cut in the curved shape of that extra stitching. Another noticeable feature of earlier models of chucks is the extra height of the outer wrap. This is the white rubber above the outer sole topped with the thin line of rubber piping, usually black in color but red for white shoes and navy blue for blue shoes. The difference is often an additional 1/4 to 3/8 inches in the height of the outer wrap, especially on the inside patch part of the shoe. The ankle patches seem virtually identical to other made in USA models. The most noticeable things about chucks manufactured in the 1970s was the use of wider piping where the canvas joins the rubber outer wrap and the smaller size of the toe caps. Instead of the usual 1/8 inch width, the upper piping on the black and navy blue pair measures 3/16 inches wide, with a much more striking appearance. The toe caps appear to be cut off a straight edge, and they are smaller in size, ending 1/8 to 1/4 inch before the start of the canvas uppers. In the case of the black pair, there is also a 3/16 inch glue line that appears between the end of the toe cap and the start of the canvas uppers. The upper outer wrap still is at a high level on the 1970s shoes, in some places equaling the height of the outer sole. Shoes through this decade continued to be issued with tubular cotton stretchable laces that were 7/16 inches wide. Laces would change on chucks when the Converse company instituted cost cutting measures in the 1990s. The outer soles continued to be made of all rubber and formed in one piece, molded from the unique Converse design of diamond squares, diagonal and straight lines, and the triangular area that says “Converse All Star” and shows the shoe size. Inner soles continued to be made with spongy rubber topped with canvas, and imprinted with a blue Converse boxed “license plate” logo and star. Beneath the logo were the words Made in USA. The ankle patches in the 1970s model show a great improvement in their look over the patches of the 1960s shoe. The rubber circle seems a little thicker, and has a much brighter white background. The dashes of the blue double circle are bolder looking and much closer together. The red lettering, the blue signature and star are brighter and bolder in appearance. One other noticeable feature was the length of the tongues of the shoes, which were at least 1/2 longer than they were in later years. 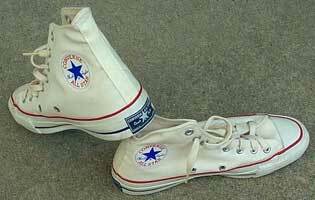 In the 1980s, chucks still used the extra canvas piece inside, but the look of the outer wrap, upper canvas, and toe cap had distinct changes. The black piping at the top of the outer wrap went back to its smaller size (1/8 inch) and the toe caps are noticeably bigger, now coming to the edge of the canvas uppers and extending along the curved edge of the uppers so that the toe cap is actually cut off in a partial U shape. The difference in length from toe guard to the end of the toe cap is 1/4 inch. Another thing that influences the perception of how the toe cap appears is the placement of the piping in relationship to the toe guard. On the 1970s pairs, there was as much as 1/4 -3/8 inches separation between the piping around the toe cap and the toe guard, but in the 1980s this was changed. There is significantly less upper wrap on these shoes. On the outside, the upper wrap only averages 1/4 inch above the outer sole, and on the inside, the highest place is only 1/2 inch. As a result there is more black canvas showing, and the ventilation holes on the inside of each shoe are 3/8 - 5/8 inches above the black piping, instead of 1/8 inch (or less) to 1/2 inch you see on the 1970s models. The change in the outer wrap also affected the placement of the curved stitching. That stitching is now higher and more pronounced on each shoe. The laces issued with the shoes were still tubular stretchable cotton laces, but their width was now down to 3/8 of an inch. The decade of the 1990s was marked by cost cutting and other management decisions that ultimately led to the company going bankrupt in 2000. Reeling from loss of market share to Nike and other brands, the company still wanted to compete as a maker of premiere basketball shoes. They decided that the Chuck Taylor shoe was now a “leisure shoe” and abandoned its marketing to mainstream Americans, although it still was their best selling product. The biggest changes in the manufacture of the Chuck Taylor was the elimination of the inner piece of canvas, which changed the way that the stitching appeared on the outer canvas. The stitching now became square in appearance, still consisting of a double row of white thread. The squares average about 5/8 to 3/4 inches across. Inside the shoe, the license plate logo was replaced with a simpler Converse logo, still printed in blue. By the end of the decade three shoe images and some other graphics were added to the imprint. Concerned by counterfeiting of their products, the company started placing “Authentic Converse Product” labels inside the tongue of the left shoe. The most significant change from the customers point of view was the change in laces. The company decided to abandon the more expensive tubular laces and replace them with flat laces that were less stretchable and shorter in length. These laces were 52” long instead of the normal 54” length needed to lace them up all of the way, so it became difficult for many wearers to lace up to the top of the shoe if they so desired. Shoes manufactured in this decade tended to have a little more height in the upper outer wrap, although not back to the extreme height of the 1970s models. Typical height (including the black piping) was now 1/2 inch. When the Converse Company announced that it was going into bankruptcy at the beginning of this century, there was a great run on remaining made in USA products and concern that an American classic was going away. Luckily these fears turned out to be untrue. The company was acquired by the Footwear Acquisition Company and manufacturing was resumed, but in Asia, not the USA. A few years later, the company was sold again to the Nike Corporation. While this was upsetting to many Converse Chuck Taylor devotees, eventually most people got over it, because their favorite shoes were being manufactured again. The Converse Company had been somewhat secretly making shoes in Asia (for the Asian and Australian markets) in the 1990s and the new owners contracted manufacture in Viet Nam, Indonesia, and China. While there was concern that the quality would not be the same, the newly manufactured chucks seemed to be nearly the same in appearance. The main changes had to do with the materials used in their manufacture, with the canvas uppers now containing more synthetic materials, and having a thinner and lighter feel to them. The rubber used for the outer soles was altered for Chinese manufactured shoes, with the addition of textile materials to the blend. The Chinese also changed the way the the outer soles were manufactured, switching from single piece construction to three piece. This way the distinctive outsole patterns of diamonds and lines can remain the same size, while the diagonal line edged outer piece can adjust with the different shoe sizes. When you compare the made in Asia models to the made in USA ones, the Viet Nam shoes seem closer in appearance to the early 1990s made in USA pair, while the made in China pair resembles the late 1990s pair in the look of the outer stitching and toe cap. The ankle patches are slightly smaller than the made in USA ones, and are more precisely circular, without the little tab edge that you can see on all made in USA pairs in the 1980s and 1990s. The inner sole logo looks the same as the late 1990s shoe and the words “Made in USA” have been taken off of the heel patch. Core Chuck Taylor shoes continue to be shipped with flat laces, but now the laces are much longer and have better stretchability. There is now a product tag placed inside the tongue of every shoe made, both right and left. In the second decade of the 21st century, two additional changes were made to the design of the Chuck Taylor. The first change was in the heel patches. The word “Converse” was added to the top of the patch. The “O” of the word has a star in the middle. The registered symbol was also removed. The second change was the addition of a slot for shoelaces on the tongue of each high top between the sixth pair of eyelets. When shoelaces are inserted in the slot, the tongue is better held in place, and it becomes easier to lace and unlace your pair of chucks in daily wear. You can see these changes in the 2018 black high top chucks gallery. These galleries show how each detail on the black high top Chuck Taylor shoe has changed over the years. With the ankle patch notice how they are cut differently, with made in USA pairs in the 1980s and 1990s having a little extra tab at the top, perfectly circular cuts for the 1960s and 2000s pairs, and jagged cuts for the 1970s pairs. Notice also the changes in lettering, brightness, and size between the different decades. The All Star heel patches look remarkably the same throughout the decades shown here; the main change occurred in the mid 1970s when dark blue heel patches with white writing were replaced with white patches with black writing. The main change since then was the elimination of the Made in USA line at the bottom of the patch when manufacturing was moved to Asia. (the Made in USA line was worn off in the 1980s pair). In the second decade of this century, the word Converse was added to the patch and the circular R registered symbol was removed. The inner stitching included an extra canvas piece in shoes made before 1990. In that decade the canvas piece was eliminated and the stitching went straight down the shoe where the tongue and upper canvas meets the toe cap. When manufacture switched to Asia in this decade the stitching style changed to continue the double cross black stitching you see on the inside of the tongue all the way down to the insole. The Made in Viet Nam shoes are also distinguished by the presence of an extra small Chuck Taylor logo label sewn onto the underside of the tongue just before the tongue meets the toe cap on the inside of each shoe. 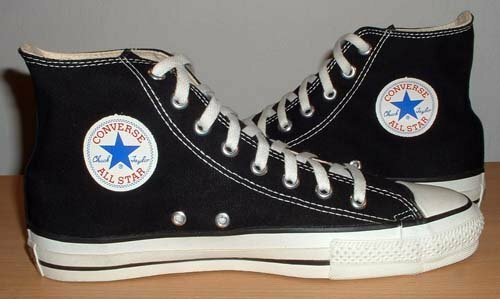 During the late 1960s, 1970s and 1980s the insoles of Chuck Taylors had a Converse license plate logo with a star and the word “converse” in lower case letters. In the 1990s this was replaced with just the word “CONVERSE” in upper case letters with the inside of the “O” in the shape of a star. In the late 1990s, shoe images and square and diamond graphics were added to the right of the word “CONVERSE”. There were even some 1990s shoes made with a blue outline of the ankle patch logo printed on the insole instead of the word Converse (not pictured). The changes of the late 1990s were incorporated into the Made in Asia shoes. In the last few years the Made in China shoes have added a third square to the left of the diamond. Converse All Star Chuck Taylor shoes have always been distinguished from other shoes by their unique outsole pattern made of rubber. The pattern has remained the same throughout the decades, but when the shoes were manufactured in China, changes were made in the rubber formula (it now contains some synthetics or textiles) and the construction changed from a single piece molded outsole, to a three piece outsole made from several parts. This is reflected in the color and sheen of the basic brown outsole. One other change is that starting in the late 1990s, the outer soles were made in a way that angles up a few degrees toward the toe cap, which better follows the natural contour of the foot. Prior to that, the outer soles were mostly flat, and some even had a tiny bit of curvature in the opposite direction. The upper canvas has double rows of white thread stitching around the outside and top of the canvas uppers. A second row of stitching runs on the other side of the metal eyelets on each shoe. Through the 1980s, the outer stitching was completed with a curved double row pattern that held in a second piece of canvas connected to the upper canvas and toe cap. In the 1990s that extra canvas piece was removed, and the stitching at the connection place became square instead. Core color Chuck Taylor shoe models always have had stitching that matched the color of the upper canvas on the canvas heel support piece on the back of the shoe. This design has not changed over the years, although many seasonal models use the same color stitching throughout. The toe caps, which are really part of the the upper outer wrap and black piping, have undergone different looks through the decades. This has been primarily determined by the thickness of the black piping, where it is placed in relationship to the front toe guard, and how the inside edge of the toe cap was cut out from the rubber wrap. Up until the 1970s, toe caps were made smaller and didn’t touch the edge of where the upper canvas started, In the 1970s the piping was wider, and the inner edge was cut in a mostly straight line. Chucks in the 1980s went back to thinner piping, the toe caps approached the edge of the canvas uppers, and the cut off edge was in more of a U-shaped configuration. In the 1990s, the toe caps got a little bigger, averaging 1 3/4 inches from the inner edge to the piping. In the late 1900s, the piping edged very close to the toe guards as well, prompting some people to call them “clown toes”. When manufacture of Chuck Taylor shoes moved over to Asia in the 2000s, one of the things that was worked on in the manufacturing process was the look of the toe caps. More emphasis was placed on making them look more consistently rounded and symmetrical in appearance. The inner edges were cut off in a clean slightly curved line, while the black piping was placed at least 1/8 of an inch from the top edge of the toe guard. The Converse All Star “Chuck Taylor” black high top is still today a great example of American art deco design, a design that has remained functional and popular for over eighty years. Not only are these shoes “cool” to look at, but they are cool and comfortable to wear, as generators of loyal fans will attest. Although it is unfortunate that the Chuck Taylor is no longer made in the USA, it still is a quintessential American product with a world-wide fan base. It is a comfort to American fans to know that high manufacturing standards are being maintained and that product is readily available. Although there are literally hundreds of new patterns and colors available each year, the original black high top still remains the most popular and most worn model. So while there have been many minor changes over the years, the basic look of the shoe has been pretty much left alone, as it should be. If you have an article or other information about Chuck Taylor sneakers to submit to this website, please contact us at mail@chucksconnection.com.